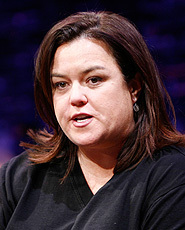 Life goes on for Rosie O’Donnell. In a video blog posted Wednesday on Rosie O’Donnell’s website, there was no mention of “The View” as the star shopped for shoes with daughter Vivienne. But Donald Trump just can’t seem to let go of the controversy surrounding Rosie’s early departure. He is still making the talk show rounds attacking Rosie, fueling their bad blood. He later joined “The O’Reilly Factor” host Bill O’Reilly to blast the comedienne. As for who will be replacing Rosie, inside sources are whispering names to “Extra” like Kathy Griffin, Roseanne Barr, Sherri Shepherd and Whoopi Goldberg. Even Oprah’s best bud Gayle King is rumored to be in the running, as the kindler, gentler Rosie replacement. Meanwhile, “Extra” may have just landed Rosie a gig! Co-chairman of NBC Entertainment Ben Silverman told “Extra” he wants Rosie to join his team! Looks like we’ll be seeing a lot more of Rosie soon. Is Roseanne Barr Replacing Rosie?